Did I mention that I’m really proud of my wife? She’s amazing. I am so happy that she is growing through this situation with her work, and it is so great to see her standing up for herself and her co-workers. She’s starting to develop her anger and frustration into productive means for changing the situation, she’s toughened up… which is really just so cool to see because it is so way outside of her comfort zone, and I totally love it! Am I gushing? So… a bit of an update… First… there was a visit from someone from the corporate office this week, and one of the other teachers overheard them saying “It is corporate policy that no-one at this facility is allowed to clock in until the ratio is met’. At least we know where they stand? Second, we contacted the Department of Labor… and they are in a word, ‘Excited’ about the prospect of working on the case, and have been coaching us on where we go from here. Apparently they review and research back through 2 years of employee history and if it’s shown that they’ve been doing this for awhile (they have been) … they could be looking at a substantial lawsuit. 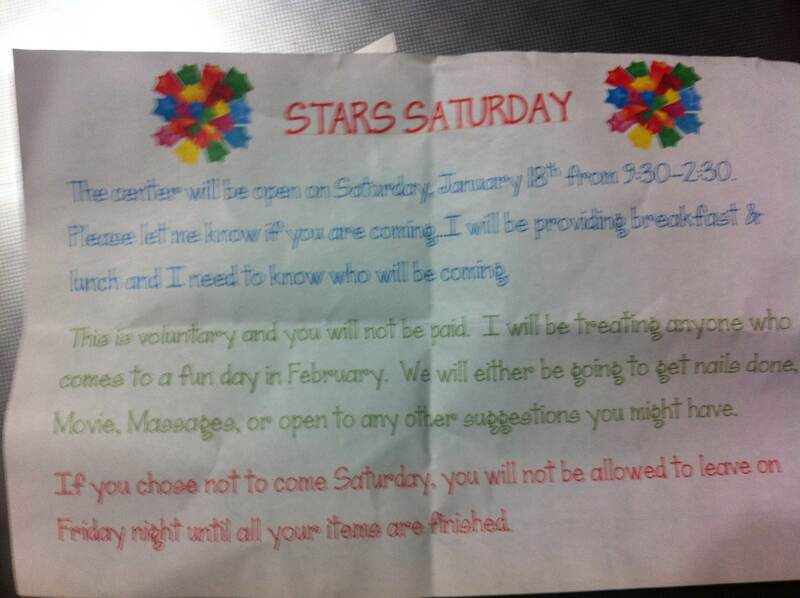 There was another day care facility in Clarksville that was closed for the same exact reasons. Third, Melissa told me this week that apparently there is another teacher at the facility who has frequently been asked to clock out so that she can clock in. What a horrible position to put your employees in, making them feel guilty about wanting to get paid for their time, and forcing other teachers to give up their own time to accommodate. When Melissa reacted to this… the director gave her some noise about how she is ‘obligated in the terms of her contract to help them achieve their stars rating’. Right… and they are obligated to pay for the time that their employees spend at work doing that. Oh, and by the way… being required to stay late Friday night if needed would also be ‘voluntary’. Needless to say, she won’t be volunteering for either. She has decided that instead she just won’t be teaching her students during the day so that she can scrape 6 month old paint off chairs and put photos on her bulletin board because she just does not have enough paid time to do both. Nice to know where your daycare dollars are going, eh? I don’t know what planet these folks live on…but while free breakfast, getting your nails done, movies and massages are normally fun with people you actually enjoy hanging around with, they don’t put food in your refrigerator. Why can’t they just pay everyone for the time it takes to meet their goal of passing the Stars inspection? I think they need to look up the meaning of the word ‘incentive’, because forcing someone to work ‘voluntarily’ and then offering them a gift in trade is not an incentive and it’s not even in the ball-park of showing appreciation. As an employer, you pay your employees fairly and then anything that you do above that is incentive or just human.